Welcome to Panther, formerly Kittyui! Panther is a user interface replacement I started releasing back in 2008, it became popular all over the world which always amazed me, and was in the top 10 donwloaded UIs and though I've taken extended breaks from WOW, every time I come back is a new challenge to see if I can get my UI working with current WOW. The UI changes the look and feel of the game through the use of my own custom graphics, keybindings, it's a near complete augmentation while making quite a few things more convenient and effective (at least to me) and I am working on the thing all the time to improve it, and sometimes mess it all up and have to rethink, it helps with reaction time which is crucial for a healer and rogue. I don't play any other classes, but it seems it could be good there too, and may make you a more effective player overall. I hope you enjoy it. Just remember when you install Panther that some profiles seem to be linked to character names or revert to default, like /dom dominoes and docking station and details and /cb casting bars but once you set those profiles to Panther, you should be good to go. Extract Panther folders and move my WTF and Interface folder to your WOW directory. Disable Dominoes > Encounters to assure zone action elements are visible. Q: How do I find my account name? If your account is listed as wow1, open your world of warcraft folder > account > and you should see a folder with a unique name or numbers, that is your actual individual account name... delete the interface and wtf folders, and install mine, and rename the youraccountname folder to your individualized account ID that was there. Lots of fun changes this update! New unit frames and integration and aesthetics. First update in over a year! A lot has happened, changed, rearranged... a lot of addons are disabled and waiting and hoping for updates, like KGPANELS for our custom panels, the only custom graphic at the moment is in our welcome screen and mini map. 1. Fixed strata level issue with Weak Auras so that energy levels would not override open bags, or be overridden by Dominos button text. 2. Updated Panther Welcome Text. 3. Sharpened look to create a more expansive look and feel. 5. Addons replaced: Broker Everything with working Broker addons. 6. Updated UI sizing, font, clutter, and streamlined look and feel. 7. Updated Power Hungry Artifact Useage Items database manually. 8. 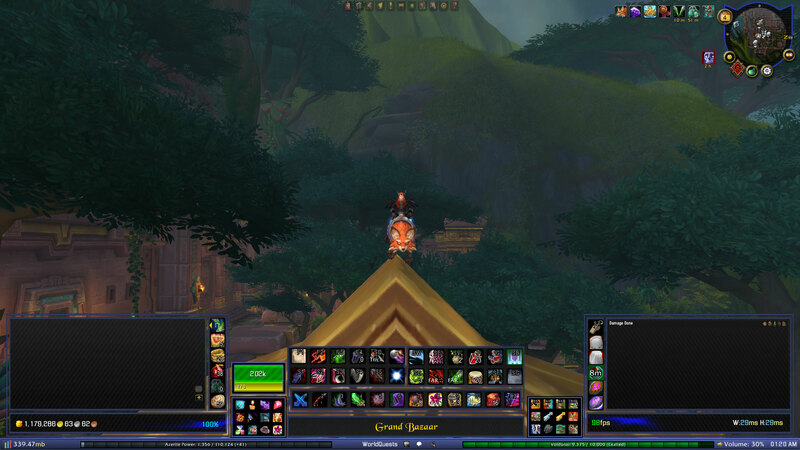 Addons added: Simple ILevel which shows you yours and others ilevels in tooltips and chat. 17. Addon removed: Werak Auras, using Aura Frames for all of it now to streamline. This is done on userside, under ESCAPE > INTERFACE > NAMES > "Personal Resource Display"
4. Streamlined Sharedmedia folder for better loading times. 4. Removed redundant Gold docking icon. 12. A bunch of other little tweaks and fixes. This update is coming tonight! it instantly swaps between your PVE and PVP gear... so be sure to set those Equipment Sets up! A lot of changes in this one. Profile emulation, Unit frame changes, Aura changes, lots of adjustments across the board, from the bones up, with more to come. Lots of little adjustments, things still to do: Add setup button on welcome screen for Reflux and Dominos Profile loading. Anyone having set up issues with my UI PANTHER, it's due to reflux switching... so here is a quick ingame fix while I work on a permanent solution. Thanks! 8. Make sure at the login screen, that out of date addons is checked. Big changes, across the board, streamlined, did away with a bag mod, I love the default bags now that they added functionality, and while they lack some organizational customization, bag addons seem to slow loading for me, just a very invasive addon it seems... so I did away with it, feel free to add a bag mod of your own liking of course. Many other changes, fixes, polishes... I hope you enjoy it! And as always, all comments are welcome and encouraged. A whole lotta polishing... and what else ya gonna do on patch day?! Utilizing more up to date mods, Skinner and more! Added Broker Garrison to my docking station broker everything environment, to clear up the minimap. Full cleaning, simplifying, balanced bars. My WOW UI just became even more amazing... I added a movement recalibration cooldown spark that just looks awesome... along with new castbars, modifications of tooltips and docking station and cleanup of various issues as well... new version is pretty serious. First polishing and finetuning, bugsack says no bugs! to hearing from you in the comments! I've missed so many people! 2. A lot of little tweaks and fixes. 3. Tooltip customization, i.e. Loot windows were in the way of unitframes. A lot of little tweaks and fixes. Removed Satrina's Buff Frame until a fix or replacement is found. Alot of fixes and tweaks in this one, I'd say a must download. or stuff I just don't remember doing. to make the UI all around more friendly and fun to use for the expansion. I am not sure what is causing my problem, but every few minutes or even less like every 30 seconds, i get micro stuttering and then eventual freezing, which usually results in a crash. In an attempt to try and figure our what is causing these stutters and crashes, I experimented with the mods, and I am not 100% but I think it was pitbull 4 causing at least most of the problems, but even with it off, it micro stutters less and does not seem to crash. I have tried these same mods in other people's UI and for whatever reason they dont cause any micro stuttering or crashing behaviour, but I dont have the patience to test all the mods. I can tell you that I have additional mods such as handy notes and light headed which do not interfere with any other mod and plays nice with the game, having verified that with other UI's and on their own. It could also be this last patch did something, other people in the guild I am in, have also commented on the same stuttering and crashing since the patch update. any help would be appreciated, i really like this UI a lot! Fixed alternative power bars for quests as they were hidden by Dominoes and Pitbull, so I fixed all that using those and moveanything. The next version will utilize 7 vertical slots instead of the current six to accomodate the new hearth and food items. Last edited by Kupotek : 02-04-19 at 04:34 AM. 8.2 PATCH UPDATE COMING REAL SOON WITH BOD WEAKAURAS AND MORE! Update: 13.3c is now available. Last edited by Kupotek : 01-23-19 at 04:21 PM. Big update coming soon... I've been studying what addons are helpful, cpu/memory intensive, conflict with others, cause problems, lag etc... so expect great things coming soon! Last edited by Kupotek : 12-16-18 at 08:39 PM. Hey all I loaded up the addon and i'm getting this blue docking station line going thru the middle of the screen. What can I do to get rid of this? You just need to set the docking station profile to Panther. Just installed the latest of your pack here, the WTF folder breaks the game, it says its running in the background but the game never comes up. If I delete your WTF folder, comes right up. Also, in your REALM folder, you have Area 52, and even if I change that to mine (Dalaran) it still doesn't work. Something is definitely up. Let me know if you have a fix for this, thanks.